Dolby Digital is the name for audio compression technologies developed by Dolby Laboratories. Originally named Dolby Stereo Digital until 1994, except for Dolby TrueHD, the audio compression is lossy. The first use of Dolby Digital was to provide digital sound in cinemas from 35mm film prints; today, it is now also used for other applications such as TV broadcast, radio broadcast via satellite, digital video streaming, DVDs, Blu-ray discs and game consoles. Batman Returns was the first film to use Dolby Digital technology when it premiered in theaters in the summer of 1992. 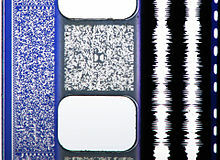 Dolby Digital cinema soundtracks are optically recorded on a 35 mm release print using sequential data blocks placed between every perforation hole on the sound track side of the film. A constant bit rate of 320 kbit/s is used. A charge-coupled device (CCD) scanner in the image projector picks up a scanned video image of this area, and a processor correlates the image area and extracts the digital data as an AC-3 bitstream. The data is then decoded into a 5.1 channel audio source. All film prints with Dolby Digital data also have Dolby Stereo analogue soundtracks using Dolby SR noise reduction and such prints are known as Dolby SR-D prints. The analogue soundtrack provides a fall-back option in case of damage to the data area or failure of the digital decoding; it also provides compatibility with projectors not equipped with digital soundheads. Almost all current release cinema prints are of this type and may also include SDDS data and a timecode track to synchronize CD-ROMs carrying DTS soundtracks. The simplest way of converting existing projectors is to add a so-called penthouse digital soundhead above the projector head. However, for new projectors it made sense to use dual analogue/digital soundheads in the normal optical soundhead position under the projector head. 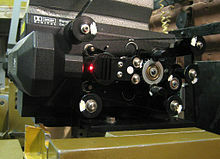 To allow for the dual-soundhead arrangement the data is recorded 26 frames ahead of the picture. If a penthouse soundhead is used, the data must be delayed in the processor for the required amount of time, around 2 seconds. This delay can be adjusted in steps of the time between perforations, (approximately 10.4 ms). As of 2015[update], Dolby Digital in film sound mixing is being gradually replaced with Dolby Surround 7.1, with the more advanced Dolby Atmos technology also gaining in popularity. While majority of movie theaters currently utilize Dolby Digital, virtually all films released today are mixed in Dolby Surround 7.1 and Dolby Atmos. Dolby Digital has similar technologies, included in Dolby Digital EX, Dolby Digital Live, Dolby Digital Plus, Dolby Digital Surround EX, Dolby Digital Recording, Dolby Digital Cinema, Dolby Digital Stereo Creator and Dolby Digital 5.1 Creator. Dolby Digital is the common version containing up to six discrete channels of sound. The most elaborate mode in common use involves five channels for normal-range speakers (20 Hz – 20,000 Hz) (right, center, left, right surround, left surround) and one channel (20 Hz – 120 Hz allotted audio) for the subwoofer driven low-frequency effects. Mono and stereo modes are also supported. AC-3 supports audio sample-rates up to 48 kHz. Before 1996, was marketed as Dolby Surround AC-3, Dolby Stereo Digital, and Dolby SRD. In 1991, a limited experimental release of Star Trek VI: The Undiscovered Country in Dolby Digital played in 3 US theatres. In 1992, Batman Returns is the first movie to be released in Dolby Digital. In 1995, the LaserDisc version of Clear and Present Danger featured the first home theater Dolby Digital mix, quickly followed by True Lies, Stargate, Forrest Gump, and Interview with the Vampire among others. Dolby Digital EX is similar in practice to Dolby's earlier Pro-Logic format, which utilized matrix technology to add a center surround channel and single rear surround channel to stereo soundtracks. EX adds an extension to the standard 5.1 channel Dolby Digital codec in the form of matrixed rear channels, creating 6.1 or 7.1 channel output. It provides an economical and backwards-compatible means for 5.1 soundtracks to carry a sixth, center back surround channel for improved localization of effects. The extra surround channel is matrix encoded onto the discrete left surround and right surround channels of the 5.1 mix, much like the front center channel on Dolby Pro Logic encoded stereo soundtracks. The result can be played without loss of information on standard 5.1 systems, or played in 6.1 or 7.1 on systems with Surround EX decoding and added speakers. Dolby Digital Surround EX has since been used for the Star Wars prequels on the DVD versions and also the remastered original Star Wars trilogy. A number of DVDs have a Dolby Digital Surround EX audio option. The cinema version of Dolby Digital EX was introduced in 1999, when Dolby and Skywalker Sound, a division of Lucasfilm Ltd., codeveloped Dolby Digital Surround EX™ for the release of Star Wars: Episode I – The Phantom Menace. Dolby Digital Surround EX has since been used for the Star Wars prequels on the DVD versions and also the remastered original Star Wars trilogy. Dolby Digital Live (DDL) is a real-time encoding technology for interactive media such as video games. It converts any audio signals on a PC or game console into a 5.1-channel 16-bit/48 kHz Dolby Digital format at 640 kbit/s and transports it via a single S/PDIF cable. A similar technology known as DTS Connect is available from competitor DTS. An important benefit of this technology is that it enables the use of digital multichannel sound with consumer sound cards, which are otherwise limited to digital PCM stereo or analog multichannel sound because S/PDIF over RCA, BNC, and TOSLINK can only support two-channel PCM, Dolby Digital multichannel audio, and DTS multichannel audio. HDMI was later introduced, and it can carry uncompressed multichannel PCM, lossless compressed multichannel audio, and lossy compressed digital audio. However, Dolby Digital Live is still useful with HDMI to allow transport of multichannel audio over HDMI to devices that are unable to handle uncompressed multichannel PCM. Dolby Digital Live is available in sound cards using various manufacturers' audio chipsets. The SoundStorm, used for the Xbox game console and certain nForce2 motherboards, used an early form of this technology. DDL is available on motherboards with codecs such as Realtek's ALC882D, ALC888DD and ALC888H. Other examples include some C-Media PCI sound cards and Creative Labs' X-Fi and Z series sound cards, whose drivers have enabled support for DDL. NVIDIA later decided to drop DDL support in their motherboards due to the cost of involved royalties, leaving an empty space in this regard in the sound cards market. Then in June 2005 came Auzentech, which with its X-Mystique PCI card, provided the first consumer sound card with Dolby Digital Live support. Initially no Creative X-Fi based sound cards supported DDL (2005~2007) but a collaboration of Creative and Auzentech resulted in the development of the Auzentech Prelude, the first X-Fi card to support DDL. Originally planned to extend DDL support to all X-Fi based sound cards (except the 'Xtreme Audio' line which is incapable of DDL hardware implementation), the plan was dropped because Dolby licensing would have required a royalty payment for all X-Fi cards and, problematically, those already sold. In 2008, Creative released the X-Fi Titanium series of sound cards which fully supports Dolby Digital Live while leaving all PCI versions of Creative X-Fi still lacking support for DDL. Since September 2008, all Creative X-Fi based sound cards support DDL (except the 'Xtreme Audio' and its based line such as Prodigy 7.1e, which is incapable of DDL in hardware). X-Fi's case differs. While they forgot about the plan, programmer Daniel Kawakami made a hot issue by applying Auzentech Prelude DDL module back to Creative X-Fi cards by disguising the hardware identity as Auzentech Prelude. Eventually Creative struck an agreement with Dolby Laboratories regarding the Dolby license royalty by arranging that the licensing cost be folded into the purchase price of the Creative X-Fi PCI cards rather than as a royalty paid by Creative themselves. Based on the agreement, in September 2008 Creative began selling the Dolby Digital Live packs enabling Dolby Digital Live on Creative's X-Fi PCI series of sound cards. It can be purchased and downloaded from Creative. Subsequently Creative added their DTS Connect pack to the DDL pack at no added cost. E-AC-3 (Dolby Digital Plus) is an enhanced coding system based on the AC-3 codec. It offers increased bitrates (up to 6.144 Mbit/s), support for even more audio channels (up to 15.1 discrete channels in the future), and improved coding techniques (only at low data rates) to reduce compression artifacts, enabling lower data rates than those supported by AC-3 (e.g. 5.1-channel audio at 256 kbit/s). It is not backward compatible with existing AC-3 hardware, though E-AC-3 codecs generally are capable of transcoding to AC-3 for equipment connected via S/PDIF. E-AC-3 decoders can also decode AC-3 bitstreams. The fourth generation Apple TV supports E-AC-3. The discontinued HD DVD system directly supported E-AC-3. Blu-ray Disc offers E-AC-3 as an option to graft added channels onto an otherwise 5.1 AC-3 stream, as well as for delivery of secondary audio content (e.g. director's commentary) that is intended to be mixed with the primary audio soundtrack in the Blu-ray Disc player. Dolby AC-4 is an audio compression standard supporting multiple audio channels and/or audio objects. Support for 5.1 channel audio is mandatory and additional channels up to 7.1.4 are optional. AC-4 provides a 50% reduction in bit rate over AC-3/Dolby Digital Plus. Dolby TrueHD, developed by Dolby Laboratories, is an advanced lossless audio codec based on Meridian Lossless Packing. Support for the codec was mandatory for HD DVD and is optional for Blu-ray Disc hardware. Dolby TrueHD supports 24-bit bit depths and sample rates up to 192 kHz. Maximum bitrate is 18 MBit/s while it supports up to 16 audio channels (HD DVD and Blu-ray Disc standards currently limit the maximum number of audio channels to eight). It supports metadata, including dialog normalization and Dynamic Range Control. These configurations optionally include the extra low-frequency effects (LFE) channel. The last two with stereo surrounds optionally use Dolby Digital EX matrix encoding to add an extra Rear Surround channel. Many Dolby Digital decoders are equipped with downmixing to distribute encoded channels to speakers. This includes such functions as playing surround information through the front speakers if surround speakers are unavailable, and distributing the center channel to left and right if no center speaker is available. When outputting to separate equipment over a 2-channel connection, a Dolby Digital decoder can optionally encode the output using Dolby Surround to preserve surround information. Dolby Digital audio is used on DVD-Video and other purely digital media, like home cinema. In this format, the AC-3 bitstream is interleaved with the video and control bitstreams. The system is used in bandwidth-limited applications other than DVD-Video, such as digital TV. The AC-3 standard allows a maximum coded bit rate of 640 kbit/s. 35mm film prints use a fixed rate of 320 kbit/s, which is the same as the maximum bit rate for 2-channel MP3. DVD-Video discs are limited to 448 kbit/s, although many players can successfully play higher-rate bitstreams (which are non-compliant with the DVD specification). HD DVD limits AC-3 to 448 kbit/s. ATSC and digital cable standards limit AC-3 to 448 kbit/s. Blu-ray Disc, the PlayStation 3 and the Xbox game console can output an AC-3 signal at a full 640 kbit/s. Some Sony PlayStation 2 console games are able to output AC-3 standard audio as well, primarily during pre-rendered cutscenes. Dolby is part of a group of organizations involved in the development of AAC (Advanced Audio Coding), part of MPEG specifications, and considered the successor to MP3. Dolby Digital Plus (DD-Plus) and TrueHD are supported in HD DVD, as mandatory codecs, and in Blu-ray Disc, as optional codecs. The data layout of AC-3 is described by simplified "C-like" language in official specifications. An AC-3 stream is a series of frames; The frame size code is used along with the sample rate code to determine the number of (2-byte) words before the next syncword. Channel blocks can be either long, in which case the entire block is processed as single modified discrete cosine transform or short, in which case two half length transforms are performed on the block. Below is a simplified AC-3 header. A detailed description is in the ATSC "Digital Audio Compression (AC-3) (E-AC-3) Standard", section 5.4. A free ATSC A/52 stream decoder, liba52, is available under the GPL license. Audio codec AC3 is covered by patents (though these are now expired). Patents are used to ask to pay a commercial license to publish an application that decodes AC3. This leads some audio app developers to ban AC3 from their apps, although the open source VLC media player supports AC-3 audio without having paid for any kind of patent license. In Dolby's 2005 original and amended S-1 filings with the SEC, Dolby acknowledged that "Patents relating to our Dolby Digital technologies expire between 2008 and 2017." The last patent covering AC-3 expired March 20, 2017, so it is now generally free to use. ^ "COMPANY NEWS: A Sound Idea; Dolby Theater Format Adapted to Home Uses". The New York Times. ^ "Dolby - Dolby Digital Details". Dolby Laboratories. ^ "Dolby - What is Dolby Digital EX?". Dolby Laboratories. ^ "Dolby - What is Dolby Digital Live?". Dolby Laboratories. ^ "Dolby - Dolby Digital Plus Details". Dolby Laboratories. ^ "Dolby - What is Dolby Digital Surround EX?". Dolby Laboratories. ^ "Dolby - What is Dolby Digital Recording?". Dolby Laboratories. ^ "Dolby - Dolby Digital Cinema Details". Dolby Laboratories. ^ "Dolby - Dolby Digital Stereo Creator Details". Dolby Laboratories. ^ "Dolby - What is Dolby Digital 5.1 Creator?". Dolby Laboratories. ^ "Dolby-Frequently Asked Questions" (PDF). Dolby Laboratories. ^ "A/52B: Digital Audio Compression (AC-3) (E-AC-3) Standard, Rev. B". Advanced Television Systems Committee. ^ a b "Movie Sound Chronology". spannerworks.net. Retrieved 2017-04-02. ^ a b "History: 50 YEARS OF INNOVATION". Dolby Laboratories. Retrieved 2017-03-22. ^ "`Batman Returns` To Try Double Dolby". The Chicago Tribune. May 13, 1992. Retrieved 2017-03-22. ^ "Laserdisc Database Search By Date". Laserdisc Database. Retrieved 2017-04-02. ^ "LaserDisc Database Clear and Present Danger". LaserDisc Database. Retrieved 2017-04-02. ^ a b "Dolby Launches Dolby Digital Cinema in Theatres Worldwide with Star Wars Episode III: Revenge of the Sith". Dolby Investor Relations. Retrieved 2017-03-22. ^ "Dolby Digital Live". Dolby Laboratories. ^ Key, Gary (June 8, 2006). "Nvidia nForce 500: Biostar and MSI Aim for the Gold". AnandTech. ^ a b "A Korean reply comment (the fifth), which explains Dolby license royalty issue of X-Fi. Since the information leaked from SoundPrime, the Korean partner of Auzentech, all sources about this information are Korean". ^ "What Daniel_K wrote to the public is "This utility was written from scratch and does not contain any copyrighted code. Creative's director of developer relations, George Thorn told me, in a chat session, that is OK to provide mods as patches. It does not modify any executable or DLL, so it is NOT a crack." Daniel_K's driver MOD itself did not include any DDL module, until it began to support Creative's official DDL pack. Daniel_K's 'DDLUnlocker.exe' merely used disguise to install Auzentech Prelude DDL module". ^ Beschizza, Rob (April 1, 2008). "Daniel_K, Who Fixed Creative's Broken Vista Drivers, Speaks Out". Wired.com. ^ "There is BrokenBlaster blame about CL - Creative Labs, its much later than the issue but show common case who blame Creative Labs and admire Daniel_K". Creative Technology. ^ Beschizza, Rob (March 31, 2008). "Silence From Sound Card Maker After Customer Revolt". Wired. ^ "Dolby Digital Live pack, its DDL pack but also say "Get DTS Connect Pack FREE! for every purchase of Dolby Digital Live Pack."". Creative Technology. ^ "Dolby Digital Plus Audio Coding Tech Paper" (PDF). ^ "Apple TV - Tech Specs". Retrieved 1 January 2017. ^ a b "Dolby AC-4: Audio Delivery for Next-Generation Entertainment Services" (PDF). Dolby Laboratories. 2015-06-01. Retrieved 2016-04-26. ^ VideoLAN. "VideoLAN - VLC - Features". Retrieved 1 January 2017. ^ "SEC Form S-1". ADOBE investor relations website. Retrieved 2017-03-22. ^ "SEC Form S-1". United States Securities and Exchange Commission (SEC) EDGAR system, filed November 19, 2004. Retrieved 2017-03-22. ^ "Amendment No. 1 to SEC Form S-1". United States Securities and Exchange Commission (SEC) EDGAR system, amended February 12, 2005. Retrieved 2017-03-22. ^ "The last patent on AC-3 (Dolby Digital) expires at midnight | Hacker News". news.ycombinator.com. Retrieved 2017-05-06. Wikimedia Commons has media related to Dolby Digital. This page was last edited on 22 April 2019, at 18:56 (UTC).